The weekend is coming to an end, the kids in bed and I'll soon be doing my nightly stair stepping, this time while watching Resident Evil: Apocalypse. I do the strangest things in the name of exercise. In general, the weekend was hot and lazy. On Saturday I went to the library and took the kids swimming at lunch. Neither wanted to go, with Emma being especially fearful, remembering an old pool injury. Once we got there, of course, they had a great time and didn't want to go. Since it was so hot, the pool was practically empty, as no one things about going to a heated pool in the middle of Summer. Jamie went to visit with Angie, while I fed pizza to the kids. It was a great evening for running around, and the neighbor's had a pool out. The night brought thunderstorms and weather so hot that I slept downstairs in front of the air conditioner. Today we did yard work in the morning, mowing and hauling off yard debris. 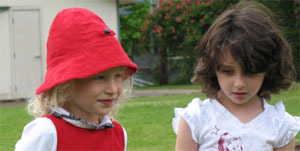 The kids played on the slip-and-slide, laughing and getting covered in grass. After lunch we went to Fred Meyers and Sam had a play date that kept him busy most of the afternoon. I puttered a bunch, doing frivolous projects and enjoying myself immensely. After dinner, Emma lit a few sparklers after constantly asking Jamie if it was time. She laughed and made faces as she waved them about. Tomorrow I sadly return to work and Sam goes with my mom to the Olympic trials. Life is good. It began with a trip to Fred Meyers, as Jamie need to pick up some miscellaneous things and she left me with the kids. As we wandered the toy section, killing a half an hour, I noticed the Nerf weaponry was on sale. Soon enough, we slyly tossed a Nerf pistol and a couple packages of glow-in-the-dark darts into her basket. When we arrived home, Sam and Emma ran around playing with it. In particular, he liked the rotating barrel and satisfying cocking mechanism. Once I pried it out of his hands, I sanded off the identifying marks, spray painted, and did my usual hand painting to make it look properly dirty and aged. It turned out exceptionally well, especially with the glowing darts. Very Steampunk, needless to say. I'm occasionally willing to embarrass myself in a variety of ways. I figured out how to hook up my wiimote to my PC, which eventually led to me using my Guitar Hero Wii guitar with the Lute Hero game I made for Neverwinter Nights. I was originally going to do a fairly plain "how to" video, but with Sam's prompting it quickly degenerated into a rock video starring my alter-ego Klaus. It's Mocha Friday already. Being sick for a couple days in the middle of the week seems to have brought this day along pretty quickly. I guess time flies if you're sniffling and caughing as well. Sam went off with my mom and Dez, collecting things for his Summer school studies about Greece. He was most excited about an orrery he discovered in the map room at the Smith Family bookstore. After I got home from work yesterday, Sam and Sebastian played in the back yard, making a giant mess out of mud and clay. Emma's last day of baking camp is today. She brought home a huge cake with assorted goodies around it. We broke out the slip-and-slide yesterday, though I think she was mostly looking for an excuse to wear a bikini. Later we visited with the neighbor girls, lipsynched to the That Spells DNA song, and put up new paper lights in her room. The Olympic track and field trials opened today. I could tell because of all the music and screaming wafting in through our open window while we tried to sleep. Emma's transitioned nicely into Summer. She's currently going to cooking camp at the Little French School. Every night she's been bringing home assorted goodies for us to munch on. Though it's often challenging to get her out the door, she seems to have a good time with the other kids and her teachers. She's also been doing her "summer school", which involves going through some Hooked on X books. They seem relatively good, and she's pretty excited about them. She finished her writing book, practicing her letters. She's got addition down and can recognize her numbers. Now I want to start in on reading, as she's just about ready to figure out letter sounds and put them all together. 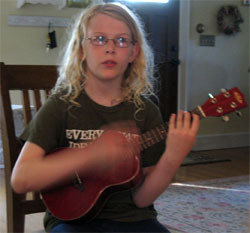 Sam was loaned an ukulele by Yayoe and given brief lessons. This morning when I was sick I was woken up by his practicing, but it was such happy music that I had to hula into his room and smile. 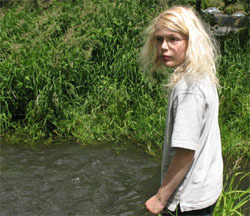 Later on he did some more practicing outside for Emma and I. It's fun watching him get the hang of it, though towards the end he was getting a little frustrated with rapid chord changes. I think I'm finally on the mend, though it's been a hard couple weeks. I mostly worked today, feeling more caught up after dropping off the face of the earth yesterday. My only consolation was that lots of other people couldn't make the critical RiverBend phone meeting that was scheduled yesterday. Mostly the last couple days have been spent taking Tylenol every four hours and balancing headache pain with nausea. I have this trick when my head hurts immensely where I get down on my knees and elbows, stuff a bunch of pillows under my stomach, press my head against the bed, and try to sleep. I think I had to perform that feat of acrobatics two or three times. Finally this morning I whipped up an elixir of Tylenol and espresso. The spoon dissolved in my coffee and a small purple mushroom cloud shot out of the cup. Fortunately it cured all my ills and gave me the strength of a hundred men. Later it wore off, but I'm mostly feeling normal except for a small ache in my stomach. My family decided there was a special place in Hell reserved for people who abuse antiques. Sam wanted to go antique shopping with Jamie. Since I was sick and wanted to "get the stink blown off me", I tagged along. While there, I found an antique slide library made by Bausch and Lomb that looked exactly like a book with a ship on the front. Seeing a price tag of only $15, I bought it on the spot. Later I ripped out all the slide holders and carefully cut a hole in the back. I disassembled my portable hard drive and it all nicely fit. Now I'm gluing everything over night and come morning it should be ready enough to haul to work. Even better, the power cord fits nicely inside. I need to secure it better and there's also a glowing light that shows drive activity. I'm sorely tempted to make a strip in the front with clear letters or symbols and have the light show through. I was sick as a dog today. It was apparently my turn after Jamie, Emma, and Sam all got it. Evidently Sadie sent along get well cards for the kids, which I'll horde for myself and write my name over theirs. Mostly I slept this morning, or tried to. Around noon I arose from the dead and vaguely puttered around with the kids. This evening I've been watching them as Jamie went off to console a friend. Fortunately they've generally been pretty well behaved all night. However, the meeting I'm taking part in is very interesting. I'm learning quite a lot about the language and ways of foundations, research, and the disconnect between researchers and practitioners. The meeting is a wonderful avenue for me to think more deeply about the questions that civic engagement researchers and practitioners grapple with. 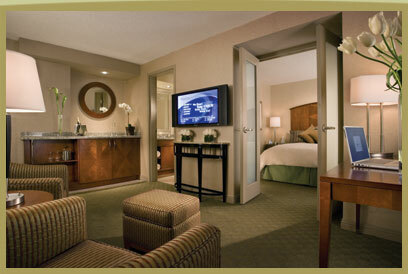 The hotel is also freakin' amazing, as I have a sixteenth floor corner suite. Good Monday morning! The plan for today is to finish up phone calls and paper work, and start summer projects tomorrow. We're starting that regime by having the lawn mower repaired. We had Jenny, Dez, Adam, Sam and Emma for brunch yesterday. Very nice to see everyone. The Audioscope is pretty much done at this point. I screwed in a leather holder for the MP3 player, hiding the ugly wires. Sam came up with a great idea to make gear-like holders for the speakers. They're made from Sculpey, baked, and painted with assorted gold and black paints. The amplifier part of the component stopped working, but the speakers are great. Sam listened to old radio broadcasts of The Shadow last night in his room. I did some more work on the keyboard, making holes for the key posts in the vinyl. Drilling holes failed horribly, wrecking the surrounding vinyl. I tried a Dremel to sand off the vinyl stretched over the holes, but that was fairly rough. My best result was with an Exacto knife and small scissors, making a rough square-shaped holes. Fortunately the material stretches so well that it didn't matter. My next step is to paint the white plastic black so it goes well with everything else. I'll try to post some pictures when I get home tonight. One of the items that seems to come up regularly in Steampunk building projects is that of the orrery. While it would take far too much time to make some elaborate system of gears to turn the planets around a sun, I ended up doing something much simpler with the same concept. Sam and I were playing with Sculpey and I said, "let's make planets". 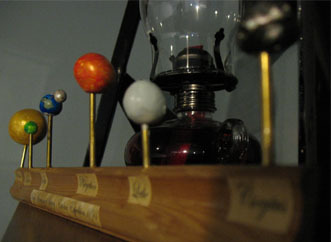 Pretty soon I had baked and colored planets resting on little brass posts. I took some wood trim, drilled holes, and varnished it for the stand. Towards the end of the day I made a label reading "Royal Astronomical Society - Eridani Expedition 1893", added planet names, and glued them on. Now it looks like part of a secret history expedition to the stars. It seems quiet appropriate next to my framed advertisement for rayguns. The new Audioscope is almost finished. I've taken out the light, as something went horribly wrong with the amplifying portion of the electronics. Fortunately the new speakers work great with the mp3 player alone. The only task left to do is to tack down a leather cradle to hold the player and hide the speaker wires. Sunday morning. I can feel myself coming down with whatever the kids have had. Hopefully I won't get it quite as bad as they did, as Sam in particular was pretty miserable. Fortunately Sam is much improved, though we're still giving him antibiotics. Emma is quite sniffly and spent much of Saturday taking it easy. Since I have the kids to myself, it's been non-stop kid watching for the last couple days. After breakfast we puttered around, doing various projects and art things. Since we were playing with Sculpey, we decided out of the blue to make a bunch of planets and paint them. They were incorporated into various stands afterwards. Emma made a heart and flowers for Etta's birthday. I helped her spell out "Happy Birthday" for her card. The party was pretty fun. Sam and I played Frisbee and kept an eye on Emma. Pretty much all of her Little French School class mates were there, and it might have been the last time she seems them all. Eventually it was time to head home, and I had to give her a bath to get all the sand out. Dinner was low-key, and the kids played an elaborate game involving airship pirates afterwards. Emma declared her hunger after I got her into bed. Though I should have known better, I made her noodle soup. When I came upstairs, she was fast asleep and the soup went back to the kitchen. As for today, we're pretty busy. Depending on how everyone feels, we may end up canceling or scaling back the day's events. At noon my mom wants us for lunch and from two to six, the neighbors are throwing a birthday party for Todd. I have no idea when Jamie's coming back. Mocha Friday came and went. I ended up making my own, as I stayed home so that Jamie could leave early to the beach. In the morning I ran errands, going to the library, movie store, and hardware store. Once I took possession of the kids, we went through all my treasures. I had picked up several things for my room, and things had arrived in the mail. I now have a widescreen monitor which looks great. Emma's computer now has a wood keyboard and mouse to go with her wood computer. I also picked up an oil lamp that the kids immediately wanted to light. We had lunch in the backyard and headed out to Metropol to get a sandwich for Sam. After that was the army surplus store, which Sam thought was pretty cool. We puttered around briefly at Island park, which seemed covered in a thick layer of goose poop. Needless to say, I was washing shoes upon our return. The rest of the day was filled with movies, Monopoly, and playing in the backyard. Emma had some trouble sleeping last night, so I was up with her for an hour or so. We awoke to thunderstorms and I'm waiting for Sam to wake up before I start making breakfast. colonoscopy this morning; they had to take out a couple little polyps, and will send them off to be biopsied. I did a little more work on the Audioscope yesterday, drilling bigger holes for the speakers, putting in holes for wires, soldering wires, and generally trying to get everything to fit properly. I'm thinking I'll end up disassembling a lot of the work I've already done. I suppose that if it's in the name of art, everything's fair. The week has been slowly moving along. Poor Sam is sick and his ear has been hurting quite a bit lately. He's really bummed that he's missing school as they're doing all sorts of fun things for these last couple days. On the plus side, he's been reading a ton, though I'm going to have to get some more books for him sooner than I thought. It's strange to think that Summer vacation starts in just a couple days. I'm not sure Jamie is mentally prepared for the day-to-day kid watching, but she assures me she's made a long list of things to do. Sam's goals for the Summer were to get in great shape and watch every episode of Buffy. We'll see how it turns out. Jamie's off to the beach this weekend, so I'm trying to think of interesting things to do. I'm thinking of taking the kids to Island Park and the army surplus store. Sam would love the latter. Happy Father's Day to everyone. I already got my present a few days early, a lunch bag that replaced the one from last Father's Day. I finally broke the zipper after trying to stuff far too many fruits in at once. Yesterday we hung out at Josh's graduation party. He's officially out of school and getting ready for the U of O this Fall. When we told Emma, she was suddenly sad, thinking she wouldn't see him again. We had to reassure her that everything would remain basically the same, and he'd still be living with Dave. 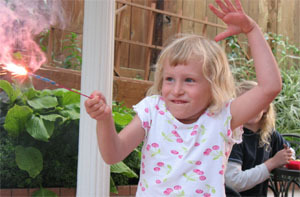 In any case, Emma played with Josh's brother, and Sam and I worked in a little badminton. Dave made way too much meat. For some reason, I was a little grumpy yesterday, perhaps a combination of too much coffee and allergies. I kept apologizing, which I hope helped. Today was lots more laid back. 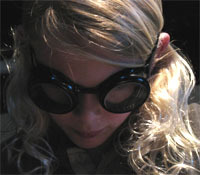 Sam helped me with my crazy Steampunk projects. Emma went to the rose gardens with Ray and Darrel. I love this Summer weather and got a bit too much sun yesterday. Sam and I made some huge progress with the Steampunk keyboard. It was a day filled with sorrow and jubilation, as we had some great successes and a few catastrophic failures. First off, we cut out all the letters, glued them into the buttons, and put on a thick layer of lacquer. Unfortunately when we saw the final result this morning, the black ink had bled into lacquer and the letters were virtually unreadable. Sobbing at the hours of work, we ripped out the letters and started again with plain buttons. This time we tested a single button with a spray of polyurethane, which turned out much better. We ended up cutting out every button, inking the edges, and using the spray for all of them. It took hours, but the results were great. The next step was to glue them on the pegs the keys rested on. I decided on gluing them in-place, just to make sure we didn't miss any key and we got them on straight. 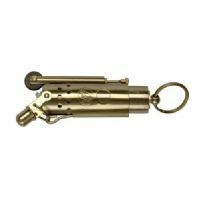 It was a good idea in some regards, as we found we missed a keys and had to reprint one. Later when removing the keys so we could get the base looking good, I discovered several keys had become superglued to the base. It was very frustrating, but I was able to remove most of them with careful use of brute force. Unfortunately the L was permanently affixed. I ripped off the key and drilled out the base, swapping with a good base for a key I never press. Eventually every key but one was finished, though there was definitely suffering along the way. Now I'm thinking of how to handle the space bar. Currently I'm slowly cutting one out of brass with a Dremel, but it's slow going. In other Steampunk news, I ordered a tiny pair of speakers for use with a Creative mp3 player. The evil marketing people had carefully made it so it can only plug into the speaker jack of their products. Fortunately fifteen minutes with a Dremel fixed that. I haven't put it into the Audoscope yet in any pretty way, but I hooked it up to the mp3 player and the sound is great. The current underpowered headphones should be nicely amplified, making it actually practical. We're looking forward to a sunny weekend! Yeah!! 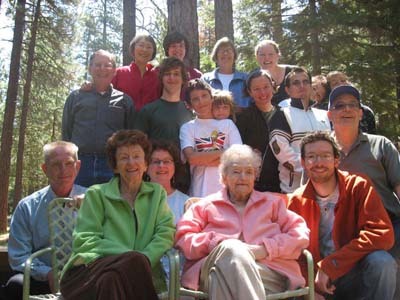 Here's a pic from the reunion in Black Butte. It's Mocha Friday, and a good thing too. The site is once again under attack by hackers, though I think I've fended them off for the moment. When I get home I need to sit down with the weblogs and figure out how they're getting in. It's highly annoying. 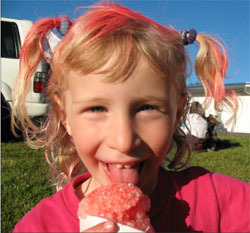 Last night was the carnival at Sam's school. We went a little late, as Jamie went to the doctor with the sore throat that everyone seems to have lately. The kids ran wild. Sam gobbled down junk food and hung out with friends. 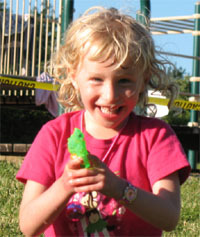 Emma had fun in the squirt gun arena and had her hair colored. I somehow missed dinner, and ended up somewhat snappy at the end. Sam was hopped up on sugar, coming down to my office after bedtime and making rug angels on the floor (which didn't work very well). Work is busy, but feels more under control than it has in a few weeks. The weather suddenly got beautiful, and I'm eager to do my run today at lunch. It'll be another six mile one, which should be nice after yesterday's weights-only workout. This weekend I'm hoping to get out with the kids and enjoy the weather. I'm also itching to put in some more work on my steampunk keyboard. I'm trying to make a 3/8" hole punch so I don't have to individually cut out 100+ circles for the keys. Ah, the sacrifices I make for art. I continue to do a little steampunk work every day, it seems. 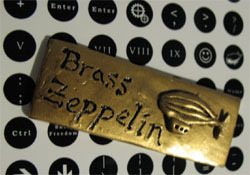 Last week I made a fun little "Brass Zeppelin" plaque out of Sculpey and spraypaint. I'm not sure what I'll do with it, but I was thinking I should come up with an imaginary company name. I decided that the Brass Zeppelin Trading Company summed up the key steampunk elements nicely. The buttons arrived yesterday and I cheerfully discovered that they should work great for the keyboard project. If you look at the screenshot, you'll see the letters and symbols I printed out to go inside the buttons. I started cutting them out with scissors, but quickly realized that I probably need to make a 3/8" hole punch if I want to get it done this century. The vinyl also showed up. It's an unusual material, though I think it'll work for my project. It's surprisingly stretchy, and I'm trying to figure out how to best use it. Sam wants to make a vest with the left over parts. We'll see how that turns out. I can tell that I'm going to need my dad's help soon. I'm running into limits that require a full machine shop. The week has been slowly moving along. I just finished a six mile run at lunch today, trying to see if I'm up for the Butte to Butte this July. I'm hoping I don't turn into one of those annoying runners that gets obsessed by distance, time, and speed. So far it seems something fun and different, and I really feel the exercise changing my body. Poor Emma was sick yesterday, the shots giving her a fever. She stayed home from school, leaving Jamie looking tired at the end of the day. I took Sam to fencing by myself, which was a bit of a treat. He has a lot of fun dueling with the other kids. My mom's coming over to ask computer advise. I think I have things planned most other nights this week. Busy, busy. 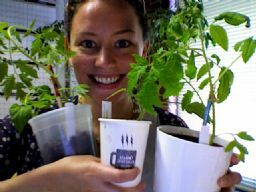 Here are my new heirloom tomatoes, just ready to go out with the rest of my garden! Emma was a rock star for her doctor appointment this morning (I'm using the term "rock star" because "great" doesn't come close to it). She was excited to see Doctory Jimmy, and answered all his questions with great humor and enthusiasm. She cheerfully followed directions and did a great job copying symbols, writing her name, and drawing a picture of herself. When it came time to get her four shots, she sat quietly on my lap as I read stories to her. She didn't cry, flinch, or anything at all. Even the nurse was amazed, saying that everyone cries when they get that last shot (which was the most painful one). Later on she said, "It was just like being pinched. A really hard pinch!" Even Sam didn't do as good as Emma when it was his turn years ago. What a trooper. The coolest gift I've gotten so far: a reproduction WWI lighter. Very steampunk. My garden is exploding with radishes, cilantro, lettuce, and baby spinach. Glad to know that this 90 degree weather is good for somebody. I spent all weekend in south county by the beach, as far away from my third story apartment as possible. It was a pleasant, lazy Sunday. Emma and I headed out at the crack of dawn to fetch some Challa bread for French toast. 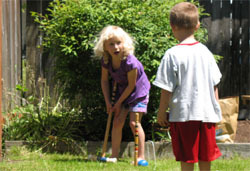 After breakfast, the kids and I played in the basement and did a short round of croquet before I headed out to the library. It's been fun getting books for the kids, and I was barely able to fit them all into my bag. My favorite part is spreading them out before the kids, their eyes wide with glee. The kids and I headed to Toys-R-Us. Sam's been earning checks by doing chores, and he finally turned in ten of them to do a project. He wanted a steampunk nerf gun, so we picked one up and later started to paint it. I asked Emma to help me pick out an outside toy. 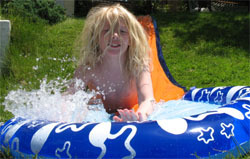 She eventually settled on a slip-and-slide, with lots of lobbying from Sam. When we set it up, Emma was a little nervous and would just crawl down the slide. Once Sam joined in, they were doing assorted crazy stunts and having a great time. The day eventually wore down. Jamie went for a walk with a friend, Sam watched Buffy, and Emma and I played assorted games in the basement. Good times. Saturday is coming to a close. The kids are both pretty exhausted. Emma's in a bath that turned pink from her red hair dye. Sam's watching Buffy and nursing a sore finger he squished in a window. I'm pretty exhausted and will likely go to bed soon as well. The day started with crepes as usual. I got everything together for the race today. Emma got decked out in her cheerleader outfit and practiced assorted moves. Everyone was in high spirits as we drove out to the hospital and got ready for the race. The race itself was somewhat challenging, and I really pushed myself. After I was done, I wandered over to the tent area to find Emma working away at some pastry. I finished in 23 minutes, so it was basically a short snack for the kids. Afterwards we went home where I ate way too much food. Next was picking up John and Natalie and heading to Valley River. We watched Kung Fu Panda, with me sitting next to Emma and Jamie going shopping. The movie was quite fun, an homage to all the Kung Fu movies of my childhood. Emma really liked it, amazingly enough. She kept making comments like "the screen is really big" and "it sure is loud." For lunch we went to 5th Street Market. The kids spend the entire time watching this elaborate fountain that poured water into tipping bell-shaped containers. I got some new running shoes at the Nike store, as my old shoes gave me blisters. When we got home, everyone played until John and Natalie had to go home. Now we're all beat. Well, I finished the race. 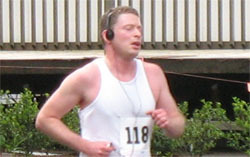 I ran the 5K in about 23 minutes, finishing 25th place overall, and 5th out of 10 in my division. I suppose one of the good things about turning 40 is that I move up to a new division. Something to look forward to. I'm pretty happy with how well I ran. I did better than I usually do, motivated by passing other runners on my way to the finish line. I wasn't quite sure how far until the finish, so I think I picked up my pace early, and then had to maintain it longer than expected. I supposed it turned out for the best. 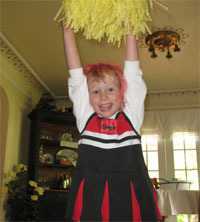 My whole family was cheering, especially with Emma in her cheerleading outfit. Everyone had a good time, as there were lots of treats and coffee for Jamie. There's a mod for Half-Life 2 called D.I.P.R.I.P., a vehicle combat game. Amazingly enough, I can get it running on all three computers, though admittedly Emma is still only barely able to drive around. She's fine, as long as we don't actually try to hurt her in any way. Sam and I decided not to actually attack each other this morning. 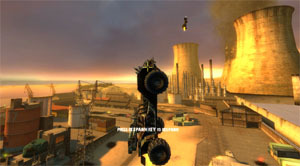 Instead, Sam discovered a method to launch yourself up a sand bank, hitting the nitro burners and flying up into the air. It was loads of fun, with the ultimate move being to perform a complete loop and land on all four tires. In this particular shot, Sam and I are synchronizing our launches. If you look closely, you can see him in the background behind me. Irish dance recital, but according to the Internet, this bronchitis stuff can be contagious, and I don't want to spead plague and pestilence throughout Portland. I will be sending good thoughts. We have had a quiet couple of weeks of new co-habitation, pretty much laid low and generally medicated. It's another sweet Mocha Friday, though I've got some time yet before I head off to work and start my day. Work is slowly getting under control again after my time away. I'm still plugging away at the new phone system, hoping to make it work properly. It's hard to believe that we've only got a couple months before the new hospital opens. Emma's been a little demon as of late. Yesterday she lost her dessert privileges by kicking in the car in the morning. When she was reminded of it that evening, she responded by biting Sam pretty hard. My only hope is that I remember Sam having a rough phase during preschool and that he's now quite sensible. I'm running a race tomorrow, a short 5K run on the trail behind the new hospital. Strangely, my family seems pretty excited about it. Emma's going to wear her cheerleading outfit, and Jamie's shopping for pom-poms today. Sam keeps asking what I get if I win. I'll just be happy if I finish somewhere in the middle of my age group. As for the rest of the weekend, I don't think we have any firm plans. I've given up on swimming. Maybe if it's nice we can run around outside. We'll see how it goes. The crazy steampunk keyboard project continues. Yesterday Sam and I finished up the rest of the keys. I had some free time after dinner, so I cut the tops off with a Dremel and made a big pile for Sam and I to clean up before his bedtime. He'd pop the tops off that were still dangling by a few threads and then I'd clean up the rough parts of the plastic. Pretty soon we had a pile of garbage and a pile of key bases. I noticed there were slight differences between the key bases. We'll probably have to sort them out before we stick buttons on. Speaking of which, I ordered 110 brass buttons that I hope will work along with a bunch of vinyl. I'm nervous about the button sizes, though theoretically the dimensions will work. I don't normally get a chance to play video games. These days I'm usually living vicariously through my kids, watching them defeat villains, save the world, or decorate a house (as is the case with Emma). I've recently been playing Mass Effect by Bioware, and have been extremely happy with it. The quality is top-notch, and the story is quite good. There are some elements which aren't remarkable, such as the combat, and occasionally the difficulty of the game doesn't match my current capabilities. Still, I think it's my favorite role-playing game of the year. In the last month or so, I've seriously gotten into running. It's a little weird for me, as I have unpleasant feelings about it back when I was in high school. It was always a hot, uncomfortable, and asthma-inducing experience for me. For some reason, I'm having a much better time with it. Perhaps I'm craving that endorphin release that happens around the mile and a half mark. This Saturday, I'm going to my first race, a 5K run on a newly opened trail next to the new hospital. Just to see if I could do it, I ran four miles outside during lunch yesterday. Other than a blister on my foot, it was great. I'm tempted to train for the 10K Butte to Butte later this year. We'll see how brave I feel. After falling in love with the steampunk keyboards, I took the first baby steps to making my own. Emma helped me disassemble an ancient HP keyboard. All that remains are the electronics, keys, and the big piece of plastic the keys go into. Emma helpfully gathered up all the keys in a big container as I popped them out. 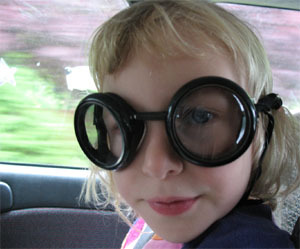 Later that evening, Sam donned the safety goggles Sadie bought and I taught him how to cut the keys apart with a Dremel. All we want is the post so that later we can glue new keys on. I think we managed to get eight done, with a little under a hundred to go. It's Sunday morning here at Black Butte Ranch. As usual, I'm the first person up. Already I took a long walk, made some tea, and am trying to be quiet while everyone sleeps. Friday was nice, especially as I had the day off work. Jamie and I chatted away as we got ready for our trip. I ran errands, including a trip to a scrap metal place to buy brass for projects. When the kids got out of school, we loaded up the car and headed out. Emma was relatively good, and I read to her for some of the way. Sam watched Buffy the entire time. The rest of the weekend was mostly hanging out with family. We spent yesterday afternoon swimming, which was fun. Last night Jenny had this big crew of people doing double-dutch jump rope in the driveway. All the cousins had a great time playing with each other. Bill, who's nineteen, helped Sam and Destin build an elaborate fort out of fallen longs. Isa and Emma helped cover it in pine needles. Every time they get together, they work on it a little more. I'm heading home today. I'll miss everyone. At the same time, sleeping in my own bed sounds quite nice. 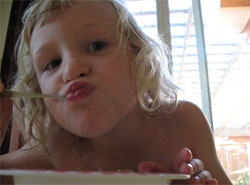 Hi, back safe and sound, and struggling with my ATT e-mail, so many apologies if I should have responded to something. Irish so gracious, and we really enjoyed our time there. The last week has been pretty delightful, too. We were met at the Eugene Airport on Friday evening by a smiling Sadie and her gentlemen friend, Greg. The next few days were crammed with everything we could do - Emma's birthday, dinner with Aric, dinner with Jenny's and Seraph's gang, and Anna, a trip to the coast, and food at some of our old faves. It just went too fast!